From Thomas Dawson, The good huswifes Jewell, 1587. 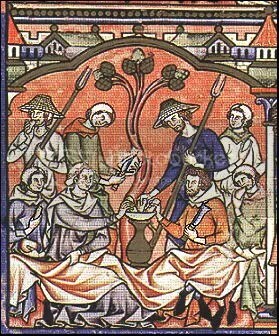 Take your hearbes and picke them very fine into faire water, and wash them all clean, and swing them in a strainer, and when you put them in a dish, mingle them with Cowcumbers or Lemmans payred and sliced, and scrape Sugar, and put in Vinegar and Oyle and hard Egges boyled and laid about the dish and upon the Sallet. 3 hard boiled eggs, peeled and cut into wedges. Wash all greens and herbs. Place into a medium sized muslin draw-string bag and spin the bag until most of the moisture has been removed. [This is an early form of a salad spinner.] 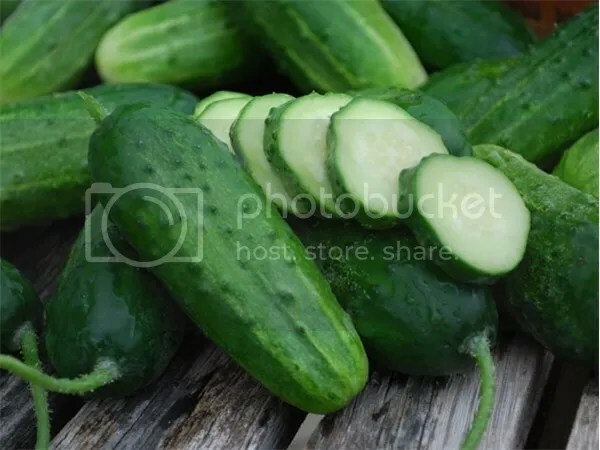 Place the greens in a salad bowl and add the cucumbers. Pour on the dressing and toss to mix. Just before serving, add the hard boiled egg wedges decoratively on top and serve it forth. Olive oil: I just used regular, but any kind you like on a salad would be fine. The recipe said only oil, not even olive oil, but I used my preference of olive oil. I suppose that sesame or almond oil could be okay also, but I don’t think of those as salad oils. The vagueness of this recipe I find challenging and exciting. I could make it so many different ways and, as long as I use period ingredients known to that country and era, I am within the parameters of the recipe. Sugar: Again, whatever you prefer. I used regular white sugar, but I thought that a light or golden brown sugar would be fine also. Elizabethans had both. I suppose that raw sugar could be used if you don’t mind the added expense. All have slightly different tastes, but all are within period usage. Flat-leaf parsley is also called Italian parsley. Cucumber: A personal choice, whatever you have or like. I would assume that English would be closer to what Thomas Dawson used, but hot house would be fine also. Just consider the size of the cucumber and make adjustments. Tarragon: with no measurements, it is a personal choice. You could leave this out and still be fine. I checked other recipes in the book and picked herbs that were used fresh. Eggs: I used AA large. It is mostly for decoration. From discussions that I have read, period eggs were smaller than ours are, but then whatever you like is fine. I picked this recipe because of it is so non-specific. It does not even tell you what herbs to use. To me this is a kind of a “what’s fresh and what do I want to do with this?” kind of recipe. You can make it in hundreds of different ways and keep coming up with different mixes and flavors. The last time I served it, I used the Moroccan Preserved Lemon, but most people didn’t like it. It is expensive to buy, so I left it out of this recipe, but YMMV. I know very few modern people who would eat fresh lemons sliced in a salad. Meyer Lemons, which are modern, and the sweet lemon was not known in Europe, although India and China knew of it. This is one of the few specifics mentioned, but it is cucumbers OR lemons. For me cucumbers won out.